The polish gods have answered a long time prayer for me with this JulieG polish. You know those times you want a nice palette cleansing color that is soft, clean, and fresh on your nails? These colors at least for me are those soft pinks shades. These are also the shades that are streaky, uneven, and taken 5 bazillion coats to build up to opacity. These are the shades that never dry because there are so many layers of polish on them 7 hours after application you get a dent in your polish. I have never found a polish in this category to fit my needs.....until now. THANK YOU to the wonderful people at Jesse's Girl and Julie G for creating this amazing creation of a polish!!!! I bow in your presence. 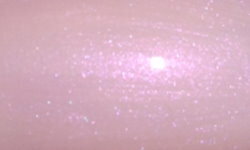 Bubble Bath is a soft pink with a subtle pink-golden shimmer. This is not streaky. This is not uneven. This only took 3 coats. This is exactly what I've been looking for, for probably 3 years now. You do not have to work with this polish to make this look nice. This applies beautifully and effortlessly. The color is soft and lovely. This is the type of color I feel would work on anyone for any situation. Love love love love love love love love this!!! This in my opinion is a must have, and I have added it as a contender on my ongoing Top 20 of 2013 list. This is one of the new color additions to the JulieG line for 2013. The only downside is this brand is only sold at Rite Aid. I don't have Rite Aid in Florida, but I ordered this polish along with some others on the Jesse's Girl Website for $3.99 each. Don't you love it when someone produces a polish that answers your polish craving perfectly? (For me it was Pretty Serious Seasonal Sunset that was exactly what I was searching for for months). This looks beautiful on you! OH MY WORD. This is just super gorgeous and an absolute must have! This is super pretty! I also *LOVE* soft pinks like this, but I can tell this one would not work for my skintone. Wow! Now that's like the perfect pink polish! So pretty! Oh wow! That color is absolutely stunning! I'm definitely going to have to order this soon! This is so lovely on you : ) That is a HG pale pink shimmer right there for sure. I love the hot pink shimmer! I love JulieG polishes and just picked up two a few weeks ago - Sharks Cove and Cabana Boy. This is a very pretty pink...I wouldn't mind having this one (I'm always looking for a light and pretty non-streaky pink). Might have to slide by Rite Aid this weekend and hope that they have this. I have about 5 pinks from Zoya and don't get me wrong I LOVE Zoya, but the pinks I've chosen just weren't what I was looking for...maybe this is it. Excited...squeal! So soft and cute, I like!